Mary Ann Messineo, longtime resident of the Merrimack Valley, passed away peacefully in her sleep at Nevins Nursing and Rehabilitation Center at the age of 88 during the morning hours of August 17, 2018. A compassionate, selfless woman, Mrs. Messineo always put the needs of others before herself. 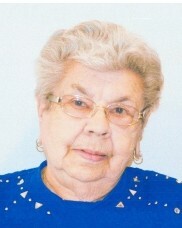 She cherished time spent with family and friends and loved her grandchildren and great-grandchildren dearly. Mary Ann Messineo was born in Detroit, MI on June 14, 1930, the daughter of the late Peter and Rose (Lopiccolo) Colombo. When she was a young child, her family moved to Gloucester, MA and resided there for a short time before relocating to San Diego, CA. She grew up in the city’s waterfront district and was a 1949 graduate of San Diego High School. During her early twenties, Mary Ann met and married the love of her life, Joseph Vincent Messineo, in the course of his Navy tour of duty and returned to Lawrence with her husband after military service, where they raised their sons together until his death in May of 1985. In later years, when the boys were older, Mrs. Messineo brought her culinary skills and kindhearted nature to the workplace while employed as a lunch aide at the John Breen and Kane schools. Mary Ann also treated neighborhood friends with many homemade baked goods during the holidays and continued this tradition long after she sold her home and moved to Methuen. In addition to her parents and beloved, Joseph, Mrs. Messineo was predeceased by her infant son; stillborn daughter; brother, Anthony Colombo; and grandson, Daniel Messineo. Mary Ann Messineo is survived by six sons: Michael of Methuen; Joseph, Jr. and his wife, Claudette, of Middlebury, CT; Randolph and his wife, Tammy, of Shelburne, NH; Peter and his wife, Deborah, of Concord, NH; Paul of Methuen; and Christopher of Andover. She also leaves two brothers: Joseph Colombo and his wife, Frances, of El Cajon, CA; and Vito Colombo of Campo, CA; as well as several grandchildren, great-grandchildren, nieces, nephews, and cousins. The Messineo family wishes to take this opportunity to thank Cathy McLaine and Joan Cassidy for their countless acts of kindness over the years in attending to their mother’s well-being. Furthermore, they would like to recognize all agency staff members who cared for their mom during her final months. Much gratitude is extended to HomeCare, Lawrence General Hospital, High Pointe House, and Nevins Nursing and Rehabilitation Center. Relatives and friends are respectfully invited to attend visitation hours on Wednesday, August 22 from 9:00 am to 11:00 am at Cataudella Funeral Home, 126 Pleasant Valley Street, Methuen. A service will follow in the chapel at 11:00 am Burial will be in Immaculate Conception Cemetery, where Mary Ann will be laid to rest by her husband. In lieu of flowers, memorial contributions honoring Mrs. Messineo may be made to Home Health Foundation, 360 Merrimack Street, Building 9, Lawrence, MA 01843, designating one’s support for the hospice residence, High Pointe House. Donation forms can be downloaded from the website. www.homehealthfoundation.org.